May 27, 2015 – Images of Pluto from NASA’s New Horizons spacecraft are growing in scale as the spacecraft approaches its mysterious target. The new images, taken May 8-12 using a powerful telescopic camera and downlinked last week, reveal more detail about Pluto’s complex and high contrast surface. The images were taken from just under 50 million miles (77 million kilometers) away, using the Long-Range Reconnaissance Imager (LORRI) on New Horizons. 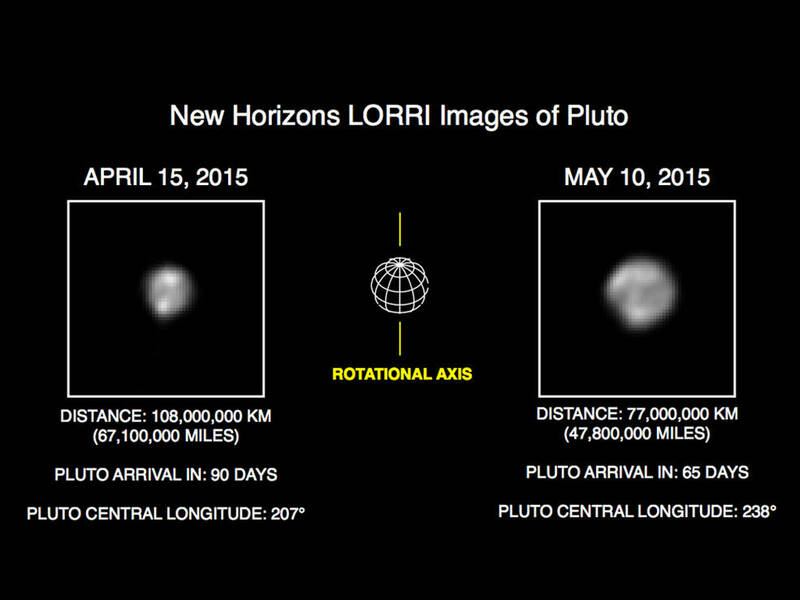 Because New Horizons was approximately 20 million miles closer to Pluto in mid-May than in mid-April, the new images contain about twice as many pixels on the object as images made in mid-April. A technique called image deconvolution sharpens the raw, unprocessed pictures beamed back to Earth. In the April images, New Horizons scientists determined that Pluto has broad surface markings – some bright, some dark – including a bright area at one pole that may be a polar cap. The newer imagery released here shows finer details. Deconvolution can occasionally produce spurious details, so the finest details in these images will need confirmation from images to be made from closer range in coming weeks.